Generate an instant preview of your email in the most popular email clients! Instant email testing & code analysis. Work for Email on Acid? Learning about Email on Acid? "Email on Acid helps us to not make mistakes"
I love that it gives so many different views and makes our testing process so much shorter. Being able to mass review and fix and update has made our custom emails so so so much better. I love how many different devices and browsers you get to view. The only thing I don't like is occasionally it shows you something that isn't actually occurring on the actual device. It also doesn't give a good idea of how it works with a touch screen device. Also sometimes the load speed is too slow for the image and you don't get a clear picture. Overall tho way more helpful than missing pieces. This product makes testing and preparing emails so much simpler. It really adds value to a business and makes sure you actually are sending readable emails to your audience no matter what device or browser they use. We are solving the issues of quicker and more efficient testing. It also improves testing accuracy and allows us to make sure our emails are accessible on different devices. This has also helped us to make much better templates for faster email creation. "The Go-to Email Rendering Platform for Small to Medium-Sized Business"
The price is much better than the leading email marketing testing platform. If you don't need all the bells and whistles--just multi-platform email rending--but still want to test an unlimited number of emails, this is the platform for you. The renderings aren't always 100% accurate. It's important that you still test emails on your own devices. Ran into issues a couple times where Email on Acid displayed some inaccurate renderings and we were made aware of how the email looked by a recipient. For small to medium-sized businesses, Email on Acid is probably your best bet. Litmus may seen attractive, but it's very easy to go over your usage limits and email previews are restricted in the most confounding way. Email multi-platform rendering. While many of the top email platforms have built-in rendering services, they aren't as comprehensive or they require more money to use. 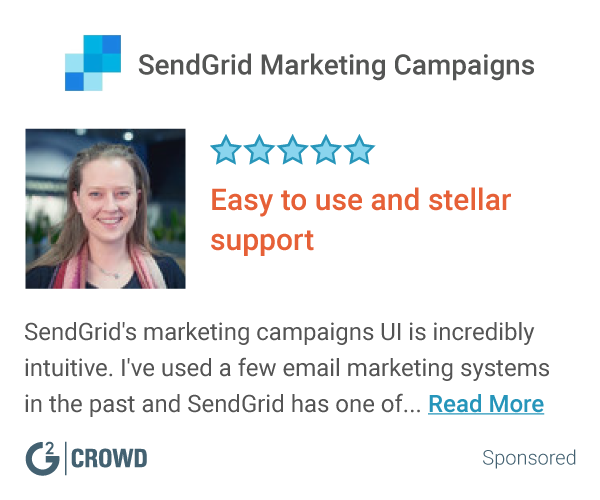 Email on Acid has filled this void in our email service provider, Salesforce Marketing Cloud, and reduced rendering issues across devices while helping the team develop better coding skills. What Email Testing solution do you use? "Great Service at a low Cost"
I love the ability to test my emails in multiple clients to ensure they present properly. We have an older client base using a wide variety of clients which requires extensive testing. The user interface can be a bit daunting and takes a bit of patience to get comfortable using. Hands down the best client replication we can find on the web. We research and rejustify the expense every year and cannot find a better solution out there. Can be a little chunky at times but has yet to fail toprovide exactly what is promised. We are ensuring that our marketing communications present as expected across multiple email clients. "Great Program, but there are a good number of bugs. " It is great to be able to see how my email will look across all devices. It is a super slow program. There are many times I have to wait hours to get results back, and even then i might not get them all. There are also some bugs that the emails do not show up in the different browsers. It allows us to test the responsiveness of emails across all platforms without having to have all of the platforms. It is really nice to have it all in one place to see where things are correct and incorrect. "Nice and easy way to test email confirmations on different platforms"
What I like about Email on Acid is its simplicity. We just set up our email confirmations to go to specific Acid's email and as a result we are able to do cross-platform and multi browser testing for web and mobile. This is a very useful tool for front-end development and quality assurance in terms of emails testing. There are not many things that I dislike about Email on Acid, but the one I can think of at the moment - when it generates previews of email for all devices and browsers some of them can take a while (e.g. 5 minutes or more) and I don't usually wait for all the previews being generated. But most popular devices and browsers are generated just fine. If you are concerned about every little detail, Email on Acid is definitely a tool for you to use. They have a free trial and you can always try it free before deciding if this is the something you are looking for. We have multiple web and mobile applications that generate emails. Mostly it's email confirmations that customers receive when an order is made, but also there are registration emails and even marketing campaigns. It's important for us that when a customer checks out his/her email from us, this email looks nice and neat. And Email on Acid in a few simple steps helps us to achieve this goal. I would definitely recommend it to a friend. I like the ease of use, the fact that you can just send to 1 email address every time and not need to add a new contact to your email automation tool each time, and the great analytics. There is also a plugin to Eloqua which is super helpful and convenient. I also like it that we can all login and see each others tests for additional quality control. The spam test requires you send to a seed list, I wish it was run with the preview and other testing. This helps us to make sure our emails look good on all platforms as well as increase deliverability. It also can help you when building your emails. We use templates but this is helpful when making changes to them, especially for people who are not as familiar with HTML. "Invaluable for all aspects of email testing"
If you're sending emails of any kind, a testing tool is vital to your workflow, and Email on Acid is one of the best options available. It has all the essential features you need, including image previews, link checking, spam testing, and an email builder. All of them work quickly and flawlessly, and a clean interface allows easy navigation to the different tools. On top of all the basics, Email on Acid goes above and beyond with their unique link map tool that visually displays where all hyperlinks are within an HTML email and lets you know if they're working or not. It also includes an extremely powerful code analysis tool that displays warnings about unsupported tags or other HTML and CSS features in emails. Email on Acid is especially helpful when working with clients and colleagues. Its share feature allows you to send a link to a third party that displays all of the important information about an email test without having to set up an account for them or bogging them down with more features than they need. There is honestly not much to dislike about Email on Acid. It does everything that you would expect from an email testing platform and more, and it does it at a lower price point than any comparable competitor. The only reason I can think of not to use Email on Acid is if your ESP already includes testing tools, but it is likely that bundled tools are not as robust as a standalone platform. Make sure you take advantage of the code analysis and spam checking features. If you use these diligently and take what you learn to heart, your emails will improve precipitously over time. Email on Acid can save tons of time and headache when troubleshooting HTML email design. It is the easiest way I've found to do a comprehensive test on any message before sending, and it's saving us money by offering a more affordable option that similar tools. "Great Email As a Service Platform"
I used ConstantContact before I found Email on Acid, and their templates and customer support is by far superior. I really like how most of their designs are very responsive to mobile and web, and how they follow design trends very closely. Most of my emails have great read and click rates due to these features. Sometimes I realized that ConstantContact has better integration when sending mass emails and the time consistency when users get them; also, predictions on best times and unsubscribe features are better in other platforms (Constant Contact). Other than that, Email on Acid is probably the best email service I've tried. Their pricing is more competitive than other email services out there, which makes it very attractive. Plus, their customer service and designs are prime. I need to communicate with my user base, whether they make a transaction, submit information, or subscribe to the weekly bulletin on my web app all communication is done through email. "Great product for email previews and analytics"
It's very simple to use and runs renders quickly. They also have a great analytics offering that integrates with loads of ESP's. Definitely one of, if not the best platform that offers this service. Great blog and community support as well. What I like best about Email on Acid is the speed the email loads. Within less than a minute of sending an email I get many email previews. The user experience isn't very nice, it needs a make over. Testing designed and coded email templates. The benefit is being able to test an email in several different email clients. This is the best email testing platform out there. It is super quick and reliable. It is a little buggy at times but it is worth it. Use a second browser to save your screenshots as it will timeout if you are using other tabs in the same browser. "EOA makes your emails GOOD"
Digital marketers know the reach and power of email, but quality analytics, development and testing is lacking from email campaign services. EOA does email creation and monitoring. That's it. And they continuously offer more. I wish the analytics had better reporting and aggregating tools. We know how or emails perform. We know reliably what's opened and clicked, for how and on what devices. We put more time and resources into more emails because we've seen their full benefit. Views on over 50 devices to make sure my designs are showing up properly in email. Takes a little while to load, or sometimes I need to refresh. I enjoy the blog posts and additional information about the market. Designing emails that can be viewed on multiple devices and look great, without having to resize and reconfigure. "Quick & Easy with Great Impact"
You can easily upload an email and see how it renders across email platforms - This helps you quickly and easily tackle any problem areas before blasting your email. The pricing is a little steep for me to recommend to Small Business Clients - A lower price point with limited features would be useful. Email Automation is a very large part of our business, so it's important that we see exactly how our emails are being received before moving forward with distributing them. An email that displays incorrectly could cause our contacts to negatively perceive our company. I like that is shows what the email will look like on multiple platforms, both mobile and desktop versions. That it does not support media queries. So you must remove them before optimizing them place them back in for testing. We are now able to ensure that our marketing emails look consistent across all mobile and desktop email clients. "Easy way to review your email"
My favorite part is that Email on Acid emails you the test emails so you can easily see what it will look like in several different email clients. Sometimes, some of the email clients just don't show up. The test malfunctioned or something. I'm able to test my emails in other email clients (besides my own) relatively easily so I can make sure my email will look right (or as close to it as possible) in everyone's inbox. "Great for email rendering tests"
I love the amount of time this service saves when performing rendering tests. Renderings can be slightly off an occasion, but still a very powerful time-saver for email dev teams. This service, and others like it, greatly reduce the time and resources needed to test emails for rendering issues. EoA also makes it easy to share those results with other stakeholders. Multi-client review all at once, shareable link to give to those without access to the EoA account. The coding check is helpful in the sense that it identifies problems, but doesn't offer solutions on how to fix it. Mostly coding issues before we send it out to our email lists. "Great Platform Rendering Tool and Thought Leader"
I like the usability of the product as well as the valuable information they provide to their users as well as on their blog. I always pay attention when they publish content about email marketing. It would be nice if you could engage with your content as if it was live on each platform, but I realize that their system is simply focused on the rendering of the content rather than the full user experience in each platform. This isn't a major dislike, it is simply the only thing I could think of. It is an amazing resource to make sure that your brand/content is being represented well in all platforms. This makes my life a lot easier. "So much fun I forget it's work!" As a marketing professional, it is increasingly important to make sure that email communications are rending correctly across different platforms and not a SPAM threat. Email on Acid provides an easy to use platform to QA your email marketing communications. Email on Acid provides me with everything I need and more. If you are considering Email on Acid, try it before you buy it. The free version doesn't offer everything but it gives you a nice idea about what details you can get. We had some issues with email deliverability and were able to address some problems that were leading to issues around email design and CAN SPAM compliance. Email on acid is a great way to preview what an email would look like to an end user. end user previews are sometimes incorrect. email marketing, inbox previews, device preview etc. "My New Favorite Email QA tool"
Its quick and easy - when you're performing QA on email you want results quickly so that you can test and make adjustments. EOA does this better than any other solution that I've used (I used to use Litmus, but I find EOA more responsive and more stable). Right now you can review how your email looks on over 68 clients and mobile devices. And its much faster than the Return Path solution I've used integrated into Eloqua. I also like the ability to cut and paste as well as send email from my ESP or marketing automation solution. I wish it would recognize the subject line when you send an email in for testing. If you've never used a QA tool for email validation, this will change your world. * We monitor all Email on Acid reviews to prevent fraudulent reviews and keep review quality high. We do not post reviews by company employees or direct competitors. Validated reviews require the user to submit a screenshot of the product containing their user ID, in order to verify a user is an actual user of the product. Hi there! Are you looking to implement a solution like Email on Acid?